Parquetry is the art of creating wood mosaics that display repeating geometric patterns. Think of the patterns you've seen in wood parquet floors, and you have the idea. A checker board is the most common parquetry example. This board is part of the Game Cube Table. The 6 faces of the Game Cube display parquetry work for 3 board games. Another face displays the tumbling blocks pattern. 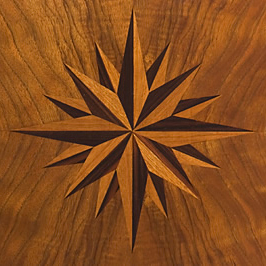 Inlaid Compass Roses are a specialty. This one decorates the center of a dining table. My standard compass rose has 16 points, 32 pieces, and is comprised of 2 contrasting woods. This Compass Rose is the centerpiece of Steve's Coffee Table. Within a pie-matched field of straight grained wood, my compass roses can be perfectly aligned with the pie-match seams. This is the look that comes from a compass rose inlaid within a burl grain pattern.